Happy Friday! When we chose Five Fall Races for this theme, I did not anticipate that I’d actually be running five races within two months this fall, but what do ya know, I am! Works out perfectly for today’s theme. I’m looking forward to seeing what races you all have on your radar or calendar for this fall. Not that I’ll be adding any more but you never know… 🙂 Per usual, I’m linking up with my girls Cynthia and Mar for the #Friday Five. You can read our linkup rules here. Please, please, please follow the rules! Note that if you don’t play nicely, we will delete your link. Have a wonderful weekend! Wineglass Marathon. Um, so as I was writing this, I was looking at the website and realized that the race is 30 days out. Wow. Even though I’m using this as training, that is still slightly terrifying. BUT – it should be beautiful and fun and I can’t wait. Army Ten Miler. This is the weekend after Wineglass and so I’ll be taking it very easy. No PRs or anything – just a fun ten mile cruise through my city. Marine Corps Marathon. This is the big one – my goal race for the fall. I’m hoping for a big PR but go big or go home, right? Hopefully when I run this one I will go big and then go home (and nap, obvi). Super excited. Richmond Half Marathon. Ahhhh – I love racing in Richmond so much. If you’ve been reading Eat Pray Run DC for awhile, then you’d know that this race is one of my favorites. I’ve only run the marathon and never the half marathon, so I’m very excited to get to experience the half this year. I’m also blogging about my training as one of the new Richmond bloggers this year – you can read more about that here. I highly recommend you come join me in Richmond in November! Annapolis Running Classic Half Marathon. I wrote a bit about the race here. I’m so excited to run in Annapolis when the weather is cooler – it’s going to be beautiful! Use code CCREF15 to save 10% when you register! What’s on your fall schedule?? Will I see you at any of these races? It seems like everyone is running the Marine Corps Marathon! I feel left out now. I’ll have to bucket list that one for sure! Have fun will all that you have stacked up in the next couple of months!! Another MCM runner-whooohoooo…oh wait-let me be clear I am not running but hope to be out there cheering and supporting. I am going to shoot for the Army 10 miler next year. God luck in your race! The wineglass half marathon is still on my bucket list! I love autumns in New York! I’ll see you at the Annapolis Classic-I’m running that race too! I’ve come to the conclusion that my bucket list for races is too darned long. I really want to run Wineglass someday. I’d like to run Richmond again this year, but it will totally depend on what else is going on that weekend. Too bad I wasn’t a runner back before we had kids when I had plenty of time and money LOL. yeah, no kids makes it much easier to do races of my choice. however the $$$ still really adds up! Marine Corp is a great marathon! I have had my eye on Richmond as well. Goodluck in your training. Your half marathons all sound amazing! I wish I was still on the east coast and could run some of those. And I’m so excited about your marathons! I didn’t realize you were running two so I’m really excited for you! we have two of the same race weekends on our fall schedule. I am spectating MCM and will be running the 8k in Richmond. It is a girls trip and there are at least 7 of us from my running group going! Wow, you have a lot of racing miles coming up this fall! Be careful with your wineglass race and recovery so close to MCM. Enjoy – I’ve done MCM and Richmond (full) – great courses. Ahhh Wineglass is so close! You will love Corning 🙂 Going to be a busy fall for sure. i am so EXCITED for wineglass! Wow, you have a packed schedule! After my marathon in two weeks, I’ll be laying low running Turkey Trots! I remember Wineglass last year just creeping so quickly after the summer. Ultimately, I was injured and couldn’t run but it’s definitely very early into the season. It looks like you have some great races lined up. YES, PLEASE. can we make this a priority???! Nice line up! I am SO excited for MCM. I have 3 half marathons leading up to it. I should find one for November to keep me moving post MCM. Thanks for the link up! I have always wanted to do Wineglass and MCM and have heard great things about Richmond and the Army 10 Miler. Funny enough – I have never done any of those despite running/living on the East Coast for so many years. I saw that it was 44 days to one of my races and I was sweating it, too! Good Luck! Erica @ Erica Finds recently posted…Friday Finds: Fall Fitness and Running FUN! The fall has so many great races. I love running when the weather is cool and that autumn feeling is everywhere. I would love to do the MCM 10k since I’m not aiming for a full marathon any time soon. Courtney, I know you’re going to do GREAT!! I am definitely not running five races this fall; kudos to you for taking on the work while you are training. It’s definitely going to pay off, come MCM time!! Marine Corps Marathon sounds so cool! Mayyybe one day I’ll do it. How much time do you allow in between marathons? Or does it just depend on the person? Richmond is such an amazing race! I definitely want to do that again this year! If all goes well in Chicago, I might come down for the Half! Sounds like you will be busy! I probably only have two left for the year. Still trying to squeeze in one more for December but I think I’m pushing my luck at work. Taking time off is tough since I have to work every other weekend. The Army Ten Miler and MCM are both on my list of races I want to run. Army I’d love to run sooner, MCM is an “eventual” as I get into doing marathons. I want to do it eventually, no matter what, even if I end up not liking the full as much as half. MCM is definitely on my life, but I’ve been drawn into trail racing this year and can’t get enough! I have a local trail 40 miler coming up in 2 weeks and I can’t wait! you have some awesome races on the calendar! I ran Wineglass two years ago and it’s a great race. Extremely beautiful!! I have already signed up for 4 but without a doubt I’ll be signing up for the 5t;h one, lol. I would love to do the MCM! I think it would be one to put on the bucket list for sure. Loved this theme thanks for the link up! How awesome. Wineglass and MCM are both on my bucket list. I hope I get to do one (both?) of them sometime soon! Good luck with all your upcoming races!! Sounds like a great list ! Many great races for you and I look forward to hearing how they go. Thanks for the link up. So many runners have mentioned MCM. I guess that is a testament to what a great race it is. Maybe one day I can do it. The Wineglass looks very interesting too. You’ve got a busy schedule! Wow Courtney you’ve got a busy fall lined up and some fun races! Can’t wait to hear how you like Wineglass – it’s on my bucket list! I LOVE fall races. You have a great list. I”ll be tackling a few half marathons myself, but dream of NYC, MCM, or Chicago for a full next fall. yes!!! come to dc and run mcm! You will see me at ATM and MCM!! I really need to do Richmond next year I think! you do – richmond is fantastic. you would love it! I have dreams of running MCM one day. With a bunch of you ladies running it this year, I hope you’re all able to meet up with each other! I’m really looking forward to seeing friends on the course! 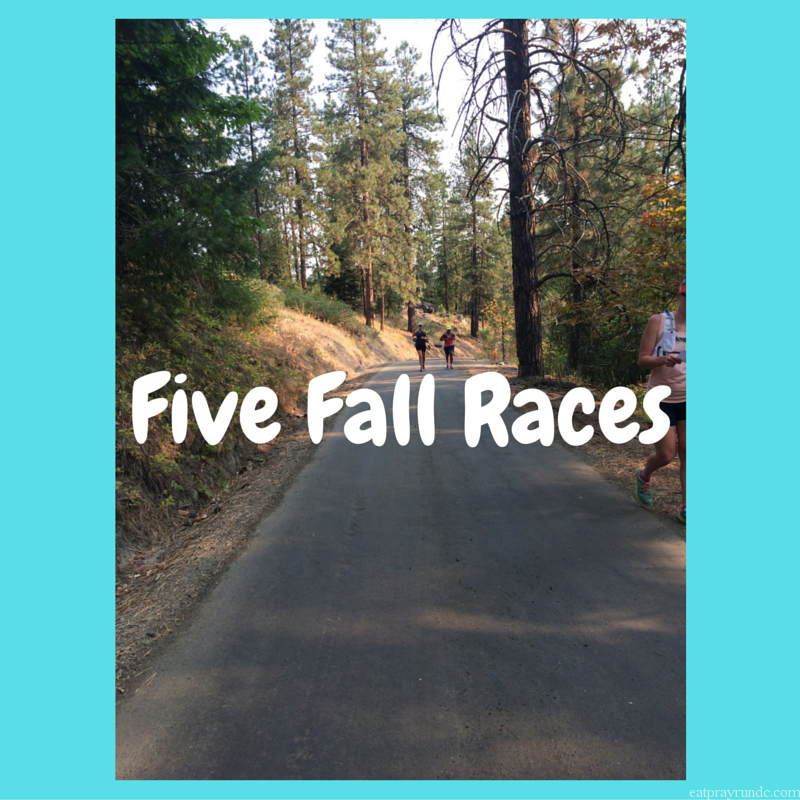 I might be more excited about your fall race schedule than my own – love this list! Haha, I’m pretty pumped about these races!! !